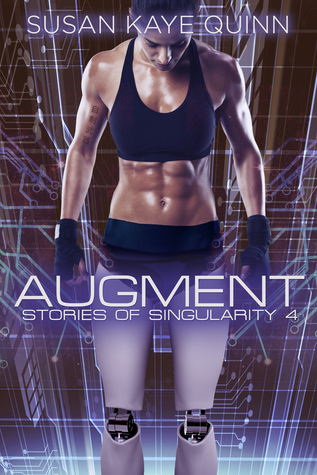 Augment is the fourth of the Singularity prequel short stories that lead into the Legacy Human series. It was exciting and tension-wrought as Miriam works to be chosen for a special task by the secret group that rebels again an enhanced human group who suppress much of what it means to be human in the new world they have created.Miriam is young and gutsy, but she has a goal. I enjoyed the story of her final push, where doubts have their moments, but she feels she really has an ultimate purpose to sacrifice herself if necessary. The short stories including this one leading into the main part of the series do their job of arousing anticipation. I already love the complex worldbuilding of a futuristic world the author has created. This novella provides more insight into the Ascendance world and more background around the resistance. Oooooohhhhhhhhh you all need to pick this book up right now... except it hasn't come out yet... :( Well, then it's the perfect time to start at the beginning of the series, so you can get caught up in time for the publication date! It could, theoretically, be read as a standalone story, but then you would be missing out on all the intricate details that make it so perfect. Mir is the most amazing of characters! She is so fierce! I loved seeing the strength of her convictions, even when she has doubts of her own motivations. Her loyalty to her friends, family and community surpass even her own safety. I have such hope that Miriam will have a part to play in the series from here out. Augment was by far, no contest, my favourite of all the Singularity short stories. Susan Kaye Quinn has proven again that she has the most adaptive style of writing, pushing the limits of speculative fiction. Having recently finished reading book two, The Duality Bridge, I have had a lot of philosophical and religious arguments with myself. Augment brought forth new arguments, rather than giving me answers. And honestly, at this point in the series, it's exactly what I was looking for. At the end of the story, the author makes a point of saying that this is a peek into book three, The Illusory Prophet. And I thought I had been excited before!! Now I just... I can't even... A copy of this book was provided by the author in exchange for an honest review. This story surprised me in a really good way. I was not expecting to enjoy reading Miriam's tale as much as I did but I found that it was probably my favorite Singularity short story thus far.The ultimate theme here is that there are those who recognize that they can make a difference in the world they live in, find ways to help those that surround them, and they are willing to do whatever it takes to make that happen.What's great about this story is that sometimes doing whatever it takes can mean having a greater impact than originally expected.I liked the insight we get into what it's like to be a human that has integrated your body with the technological advances of the time to be come something a little more. How does this marriage of two philosophies make you different but still human?Of all the stories so far, this one gives the biggest indicator that there is hope for a future that might do right by all existence, human, robot and ascender.It's a short read that is appropriate for all types of readers. Susan Quinn takes you for a ride you wont be forgetting anytime soon. In the stories of singularity each story is a story of its own yet can easily be put together. In this one Miriam needs the new MOD and she is willing to give it everything to get it. Unlike most people born at this time, Miriam was born without legs so she has been used to mods her entire life and never had to really get used to them, they became a part of who she is. Humans are a rarity and if allowed to go without mods they are kept in a living zoo to allow their DNA to stay pure. This story is one fight for life and what people believe is right, where it takes you may well be the end of it all or the beginning of something so new!!! great story great series!! Humans that are not all humans!! This is an outstanding story about a human girl that has augments. Or enhanced parts added to her body. She is out to win the best enhancement yet. One that is supposedly impossible to win. Susan Kaye Quinn is pushing the envelope again and making you think long after you have finished the story. Don't we already have humans that are augmented? People with artificial arms, legs, internal parts, etc.? This is by far the best short story I have read by Quinn. I loved it and you will too. I can't wait to read more of her work. I was given this book in exchange for an honest review. This story is very action packed with Miriam out to prove that she's got what it takes to do what no one else has ever done. And what is her real motive? Is she just trying to get back at the ascenders because they would not save her mom when they could have? And will she survive the experiment she was chosen to undergo?Wow! The ending of this one left me wanting more.